Knowledge of the political beliefs of a building’s patron or of the political system under which the building was commissioned should not inform any value judgement about that building’s architectural style. In context of a given political system, nothing is to be said about the rightness or wrongness of choosing one building style over another. Statement 2 looks like a corollary of Statement 1, but is not. And it is false. Where a designer accepts the norms of a political system, he or she (implicitly or explicitly) accepts an obligation to design, by preference, in a certain way, or ways; the menu of styles does not remain open. This may be true even as nothing is said in everyday political conversation, under a certain system, about architectural style, and no laws or guides exist concerning architectural style. Why? The obligation comes about, at a minimum, because certain stylistic choices may have consequences which do fall under the scope of political conversation, and which are touched by extant law and guidance: practical consequences. For example, the compositional conventions of a certain style may tend to produce limited or irregular fenestration, while occupants may have limited freedom to move to areas with better daylight. This practical consequence may conflict with, for instance, a prior commitment to extend to all persons equal dignity and comfort. Or an over-glazed building might have excessive heat loss; problematic in a climate change context. These might seem dull, almost banal truths … but nonetheless. Statement 2 does not follow from Statement 1 because the statements are temporally opposed. Statement 1 is retrospective; it concerns value judgements made about what has already been built; the practical consequences of the designer’s choices are assumed to have been felt, or to (at least) be irretrievable. The viewer assesses the aesthetic value that can be drawn from what now is, in the physical remains; the building is treated as a monument. Statement 2, by contrast, is forward looking. The designer is faced with choices; the practical consequences of those choices may still be felt, or avoided (if negative). The designer should make the right choices. So, even as we reject Statement 2 – as I feel we should – we are free to accept Statement 1. But should we accept Statement 1? There is strong feeling about certain architectural styles, especially certain derivatives of classical style developed in the 20th century. 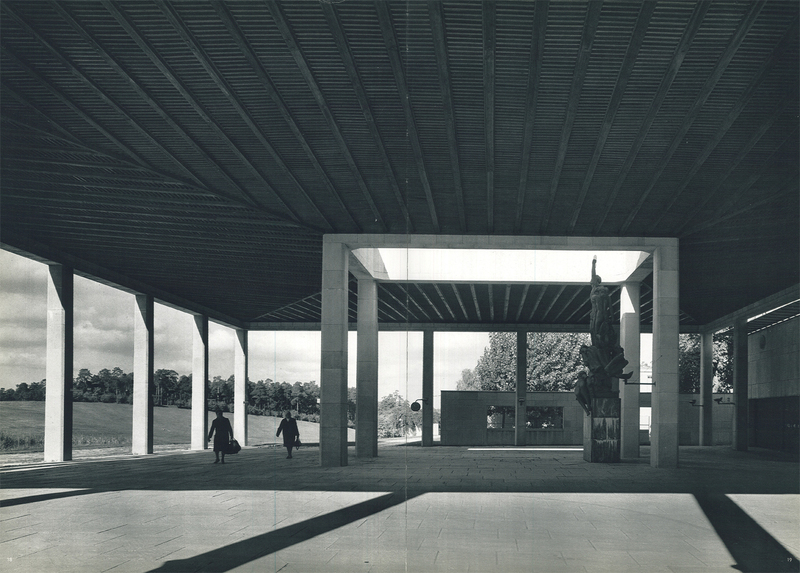 For example, the recently proposed improvements to Munich’s Haus der Kunst (1933), also designed by Troost for the Nazis, were publicly criticised: the choice to remove trees hiding the main façade was condemned with the implication that the building is considered by some to be beyond enjoyment. Troost’s Ehrentempeln (monuments to Nazis who died violently in a coup attempt; the interior of one of the pair is shown below) were demolished by US forces in 1947. An instance of a style can be rejected: it seems reasonable to say that the Ehrentempeln – these particular buildings – if kept, would have memorialised that which should not be memorialised. But this does not reject the style. And there are implications for disavowing the style of these structures. Architectural ideas freely cross borders and polities. 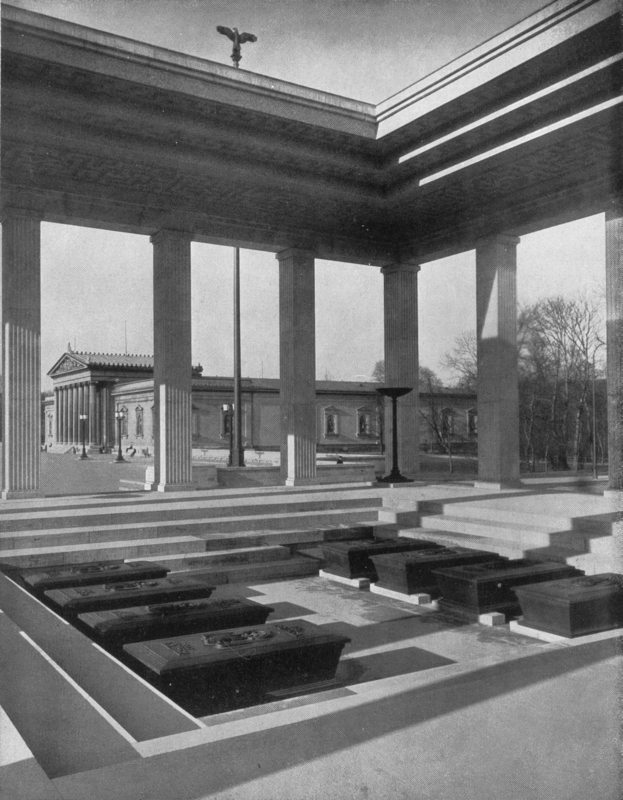 Compare Asplund’s Woodland Cemetery (below) with Troost’s Ehrentempel. Beyond the resemblance, if there is a historical connection between the two, it may be traced to Muthesius and Europe-wide efforts to forge effective partnerships between design and industry; in the English Arts & Crafts movement and the similar Deutscher Werkbund (of which Troost was a member). It is incoherent to reject one and the same aesthetic where it shows up in a deprecated polity and embrace it where it shows up in a healthy one. This entry was posted in Uncategorized on January 12, 2018 by charlespwhitaker. One archetype of desirable urban life is found in the urban village. This conception of place in the city owes much to Jane Jacobs but is also seen in i.e. Abercrombie’s 1943 analysis of London’s neighbourhoods. The urban village typically has two faces: the high street face, and the ‘countryside’, or park face. I argue that both are fundamental. Ideally, both are found close together: they allow the village to be understood and enjoyed as a village. On the one side, shops, eateries, small business, primarily indoor social gathering spaces. On the other side, green open space, room for exercise and outdoor socialising, play, escape. In between: homes (and institutional support, i.e. schools). In the urban village, everything local of value is walkable. 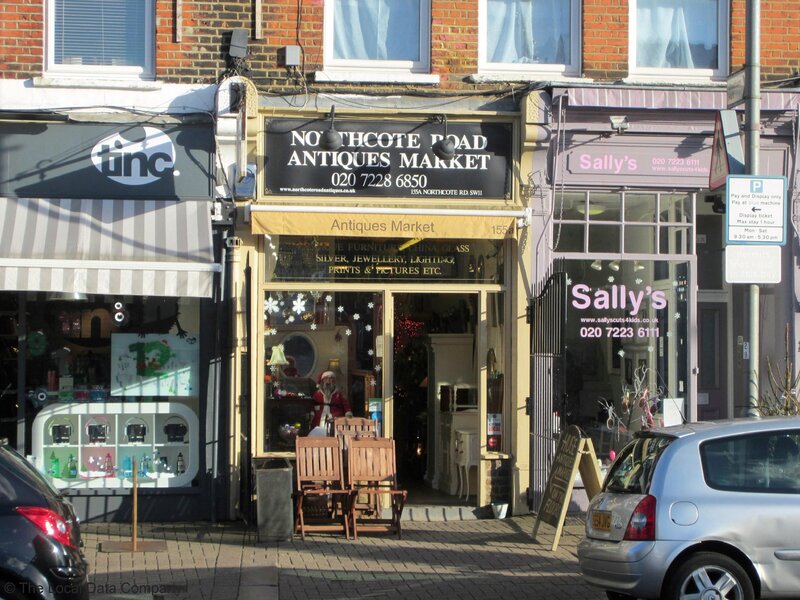 Northcote Road, Battersea, lies at the centre of an attractive and popular urban village. 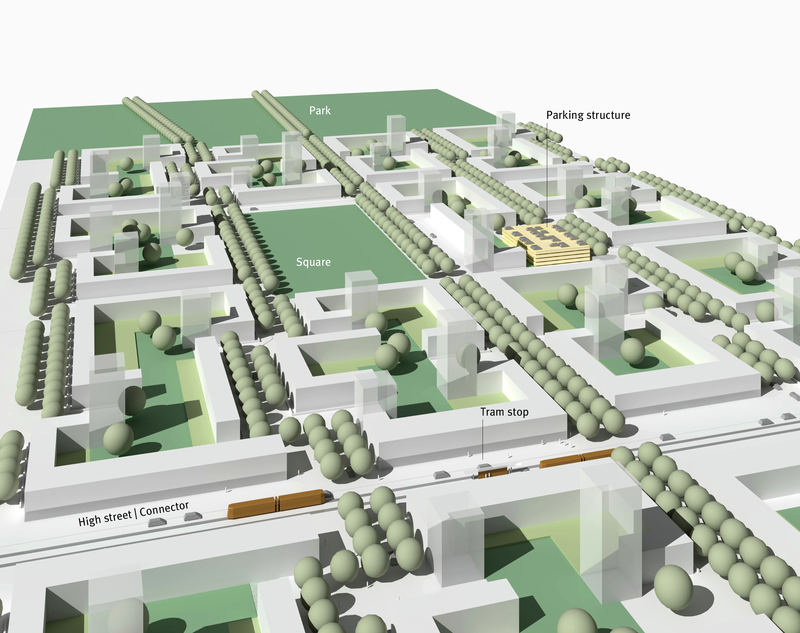 A quick look at the street layout of this neighbourhood shows that it closely tracks the model described above. Northcote Road itself is the high street. 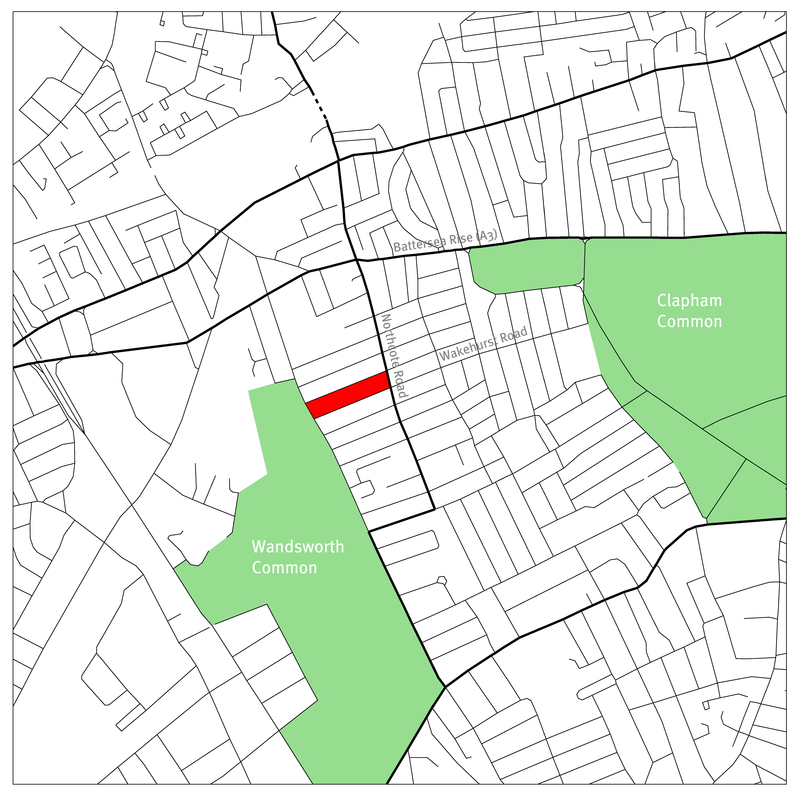 The countryside face of this village is – jointly – Wandsworth Common and Clapham Common, two decently sized urban parks. 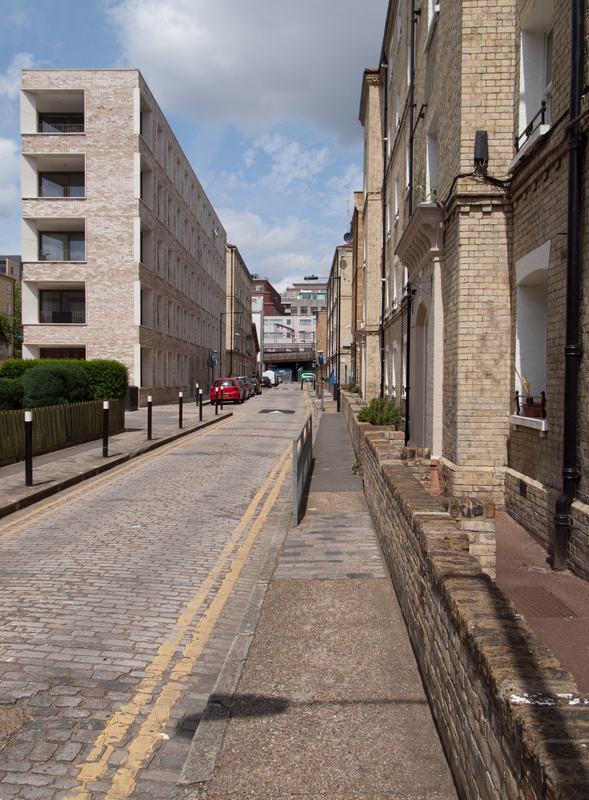 The perpendicular streets in between – Wakehurst Road for example – represent some of the most desirable streets in London for dwellings of this type and scale. 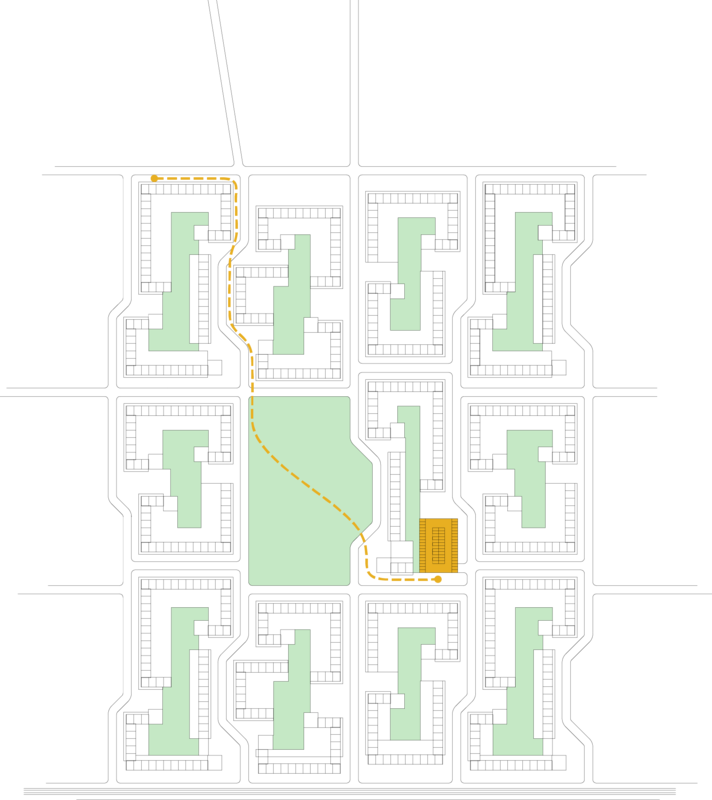 The block highlighted above is 270 m by 60 m; dimensions which – along with the simple grid topology – permit the walkability of the neighbourhood. 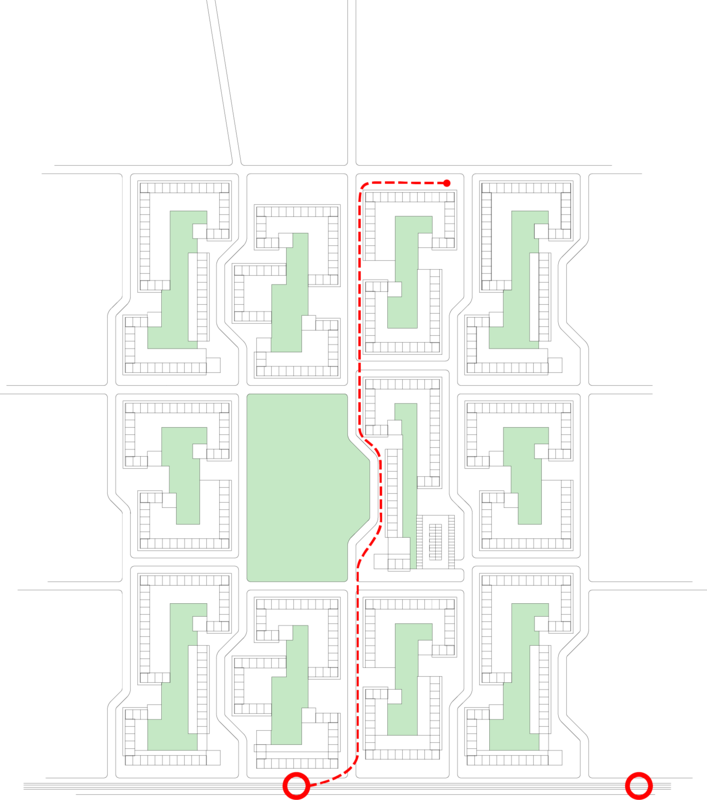 In addition, Northcote Road, although narrow, carries buses for most of its length; it is a Connector that becomes a High Street (in Transport for London’s street hierarchy), with both movement and ‘place’. 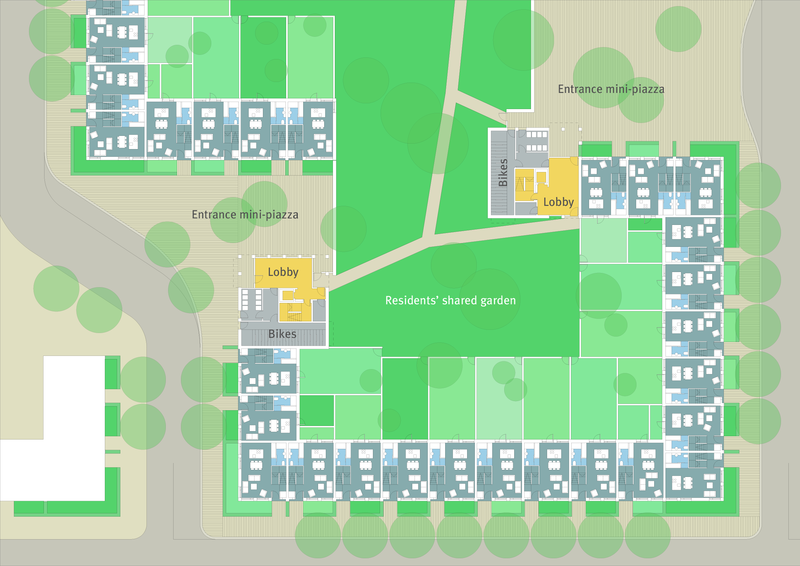 Similarly, the idealised green belt typology which I sketched out in the previous post (here) takes its place in an ‘urban village’; this time, a green belt village. Although by definition not a central district, it is not treated as suburban: it remains urban. 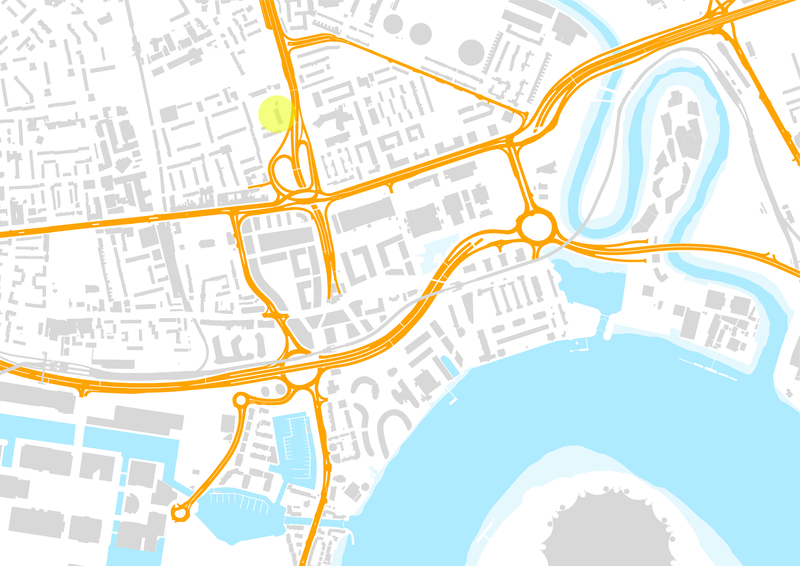 It makes up a neighbourhood with a similar topology and scale to Northcote Road, Battersea. There is a ‘lazy’ grid topology with blocks with a slightly smaller perimeter (170 m x 95 m). In the next (and probably final) post in this series, I’ll look at the sorts of planning principles that can bring additional variety and character to a new neighbourhood that is set out functionally along the lines described here. This entry was posted in Density, Green belt, London on October 11, 2017 by charlespwhitaker. The challenge of building in the green belt is typological: we may know that we want to live there, but in what sort of dwelling? The promise of living at the city edge is space: traditionally this has meant houses; detached or semi-detached, each with a private garden. 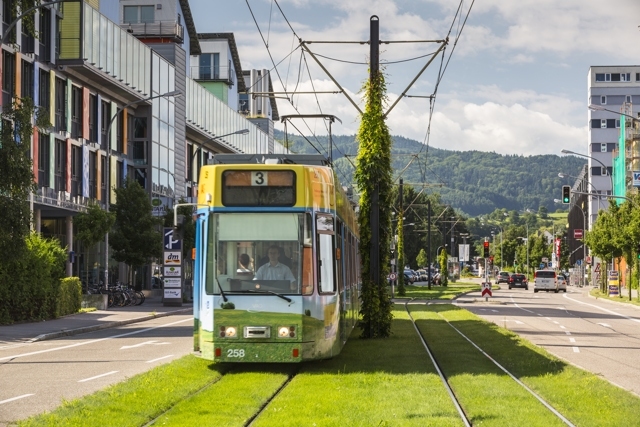 The price of this model is low density and its corollaries: inefficient land use, hard-to-reach diffuse public transport, car dependency and its associated health impacts. But if higher density is the answer, what is the best higher density model? Terraced housing offers many advantages. Density can be moderately high. Every dwelling has identity and presence; a front door at street level. Every dwelling can have a garden (or two; one at front, one at back). 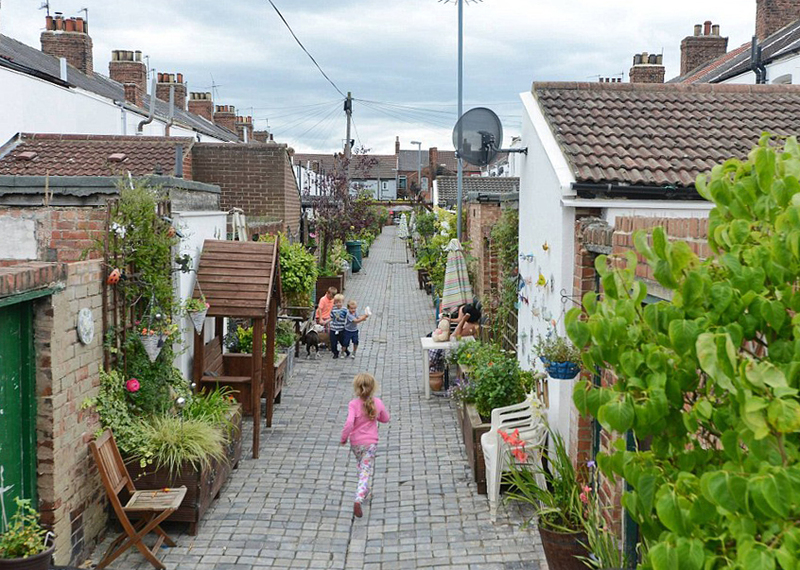 Typically, terrace back gardens remain fenced off from each other; however, in some places you see recognition of the potential of a connecting space within a terrace block interior: the image above shows a planted connecting passage in Middlesborough. Similar examples are found in Japan: Haruki Murakami describes such a space in his novel The Wind-Up Bird Chronicle. I think these spaces have further potential. The massing below describes a hybrid typology of terraced houses and point block towers (although slender, at one dwelling per floor). Together, these types enclose a block whose interior features a large, shared but secure garden for residents of all age groups. 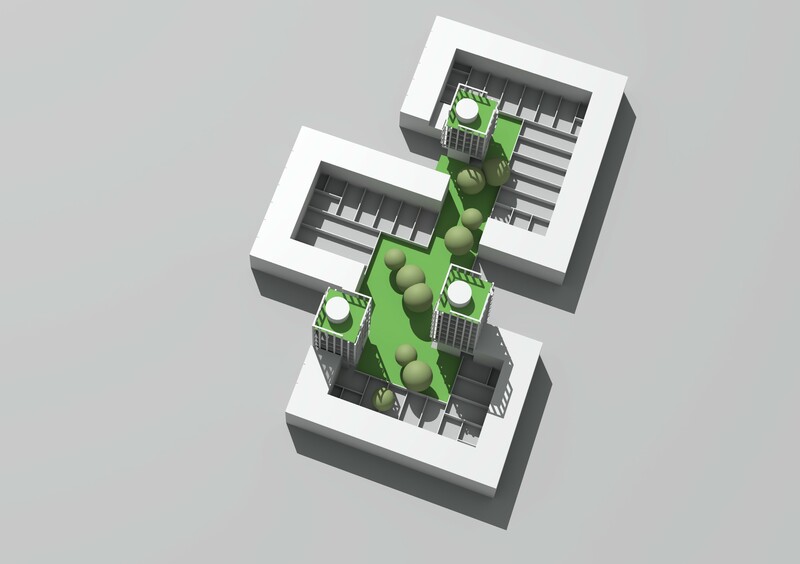 The shared garden is fringed by the private gardens of terrace houses but is also overlooked by the point block dwellings; for these blocks, the shared garden offers a park-like setting in the style of post-war modern housing, only in miniature, and without the radical ground plane permeability of that era: in effect, the proposal also hybridises models of land enclosure; some is private, some is shared but only for residents, some is public (street; pocket park). Some figures. The plot is 1.3 ha; the built area is 3,545 m2, or 27% of the plot; a relatively low figure. Interior gardens, private and shared together, are 33.5% of the plot; the shared garden is 15%. 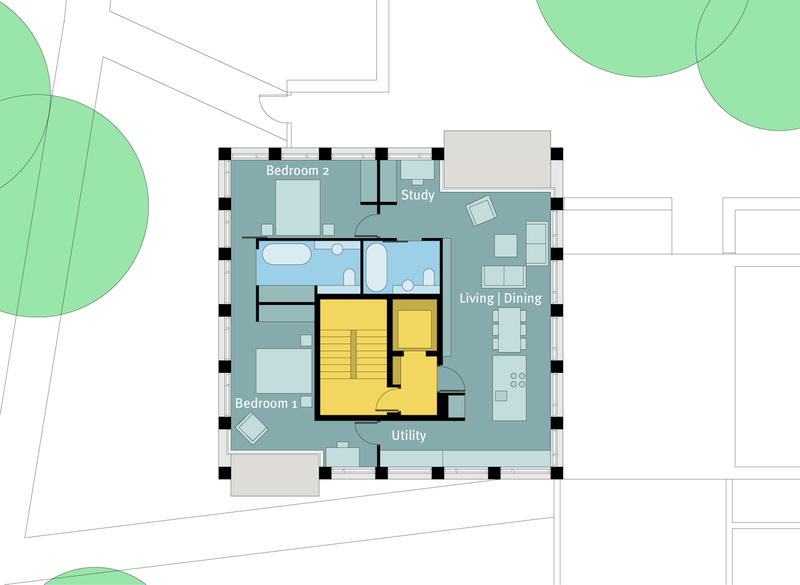 Front gardens, footpaths and public open spaces together take 27% of the plot. The density is 274 hr/ha, and apartment dwellings provide 13.5% of the habitable room count; most residents here live in houses. If most residents live in houses, and this type is doing most of the ‘work’ in terms of density, why provide towers at all? One reason is that household sizes vary, and it seems odd to confine smaller households to city centres; why shouldn’t single people or couples also live ‘in the countryside’? At the same time, one or two bedroom ‘houses’ are a difficult typology; these are implicitly one or two storey dwellings with diminished presence on a street and lower density. Duplex stacking offers a partial answer but the advantages of flatted development – with the right plan – are light and views. The freehand perspective above shows how the point blocks in the hybrid massing take full advantage of long views within the block, as well as having sufficient height to give distant views. 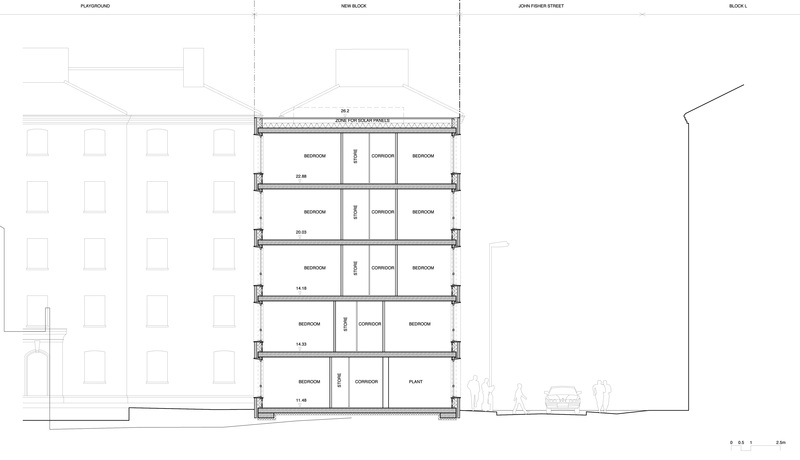 Each floor in one of these blocks is a single ‘360 degree’ two bedroom dwelling, as shown in the plan below. 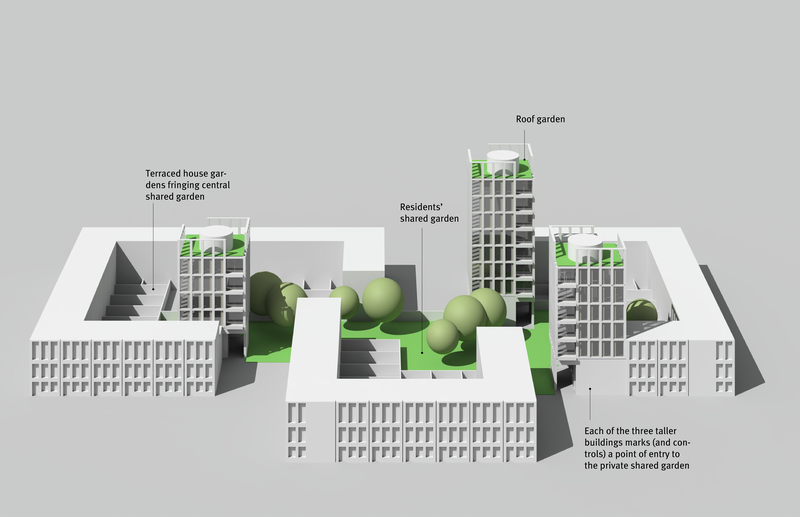 The roofs of the point blocks are planned as resident gardens, screened by the facades. A similar approach is taken with the houses to the corners of the block. Here, the interior angle makes it impossible to plan a garden at ground level for every dwelling; instead, the roofs of the houses are used as gardens as shown below. You might have spotted that no car parking is provided. In the next post, I’ll sketch an approach to urban design, street layouts and transport that can complement this typology. This entry was posted in Density, Green belt on September 1, 2017 by charlespwhitaker. 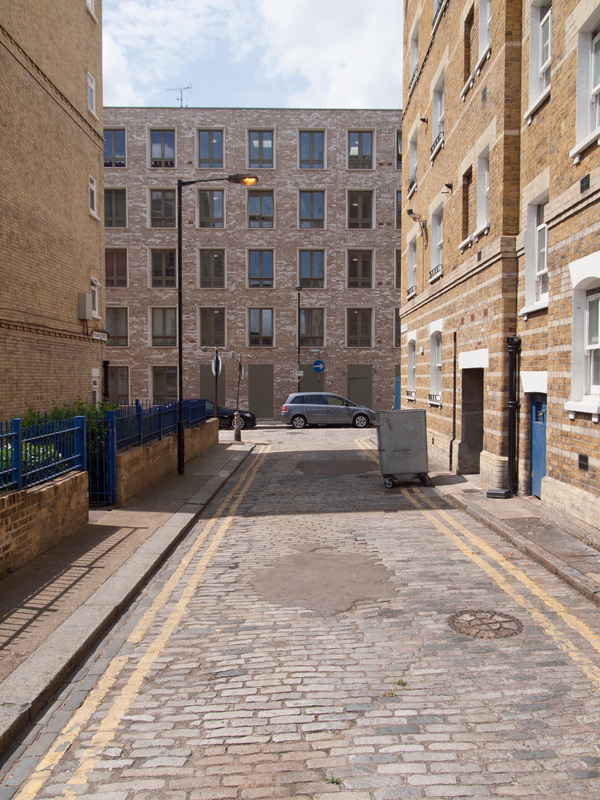 I recently went to see a new housing development in Whitechapel: Darbishire Place, by Niall McLaughlin architects, for the housing association Peabody. Darbishire Place is named for the architect of a collection of 1881 apartment buildings amongst which the new development stands: it replaces a block that was lost to wartime bomb damage. The new building has almost the same footprint as its lost predecessor, and matches its neighbours in height, and number of floors. That is, the new building is deferential. Excessively so. A similar layout is used at every floor, including the ground, which means that bedrooms and living spaces and balconies are placed hard up against narrow pavements. You can tap on the glass as you walk past. The older Peabody housing in many places has the same fault: this is ‘rent barracks’ accommodation which refuses to make sufficient plan and section offsets (i.e. a small garden, a flight of steps) to give relief and dignity to occupants. 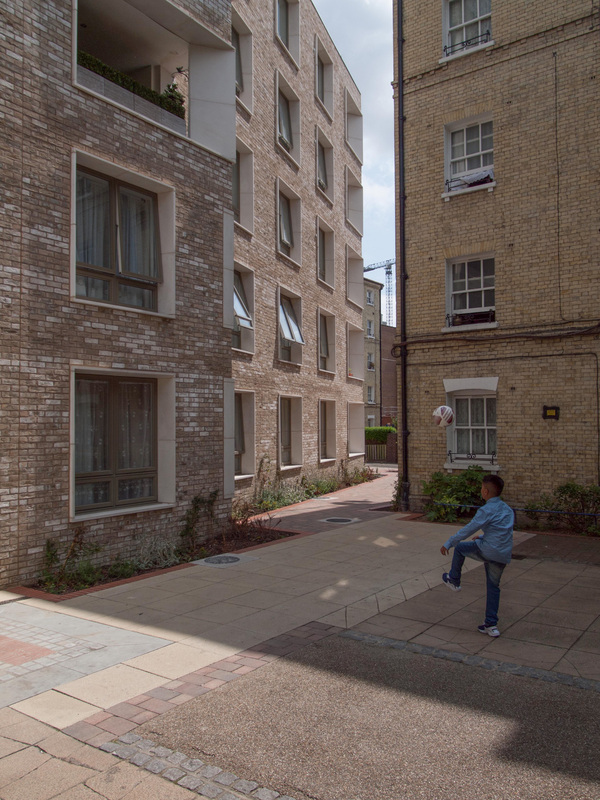 It’s true that some of the historical models for urban housing are unworkable under current disabled access rules, but what seems to be missing at Darbishire Place is the recognition that the ground condition is special and designs should respond to it. 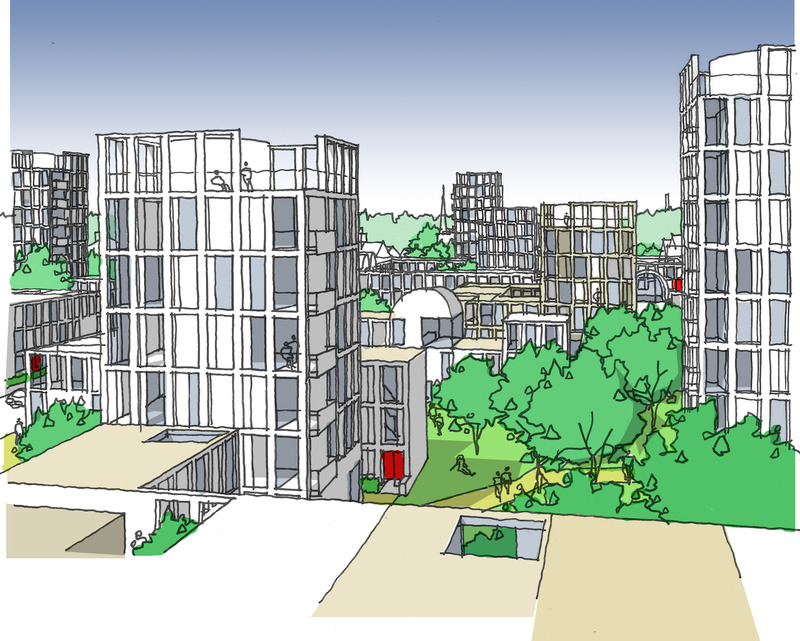 The bigger question at Darbishire Place is whether or not the whole development – old and new together – represents a good response to the need for a reasonable urban density. Considering this question leads the visitor towards questioning the project’s brief. 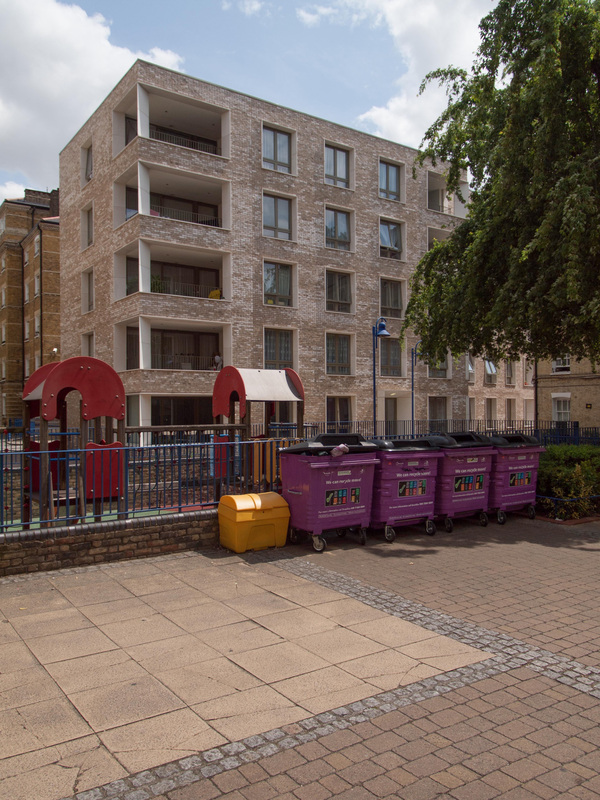 It’s hard to imagine any building on this limited site improving the qualities of estate’s central courtyard, a hard-surfaced and meanly proportioned space in which 1,100 litre wheeled refuse bins are prominent because there is nowhere else convenient for them to go. Instead of our towns being laid out in massive quadrangles with the streets in narrow trenches walled in by seven-storeyed buildings set perpendicular on the pavement and enclosing unhealthy courtyards, airless and sunless wells … no more courtyards, but flats opening on every side to air and light, and looking, not on the puny trees of our boulevards of today but upon green sward, sports grounds and abundant plantations of trees. As Britain’s oldest housing association, Peabody carries a legacy of nineteenth century building stock. They are as limited by economics as any actor in the public housing sector. 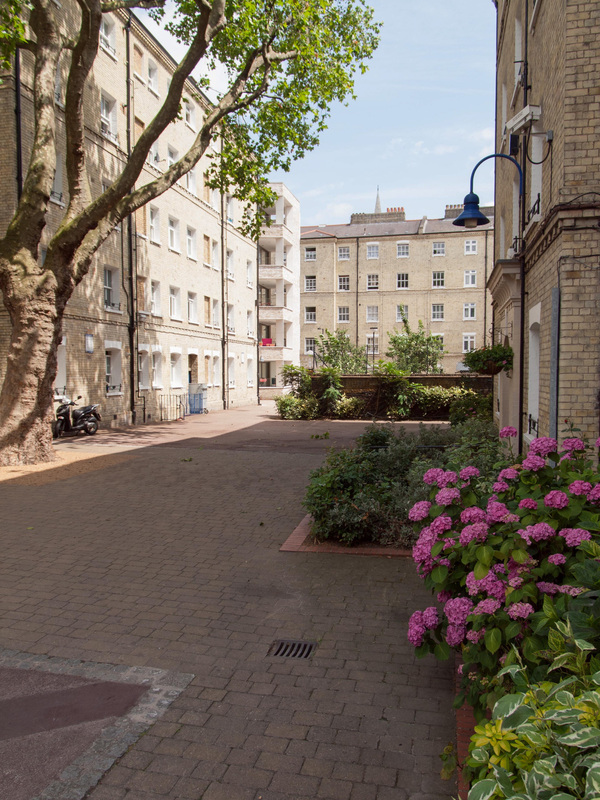 One positive quality of the Darbishire-era housing is its robustness: Peabody, unlike many local authorities, is not faced with the need to rebuild worn out blocks. Peabody maintains its estate landscapes, and aims for the best amenity spaces it can create. My point is just that enthusiasm for historical models ought to carry with it an awareness of the shortcomings of historical models. 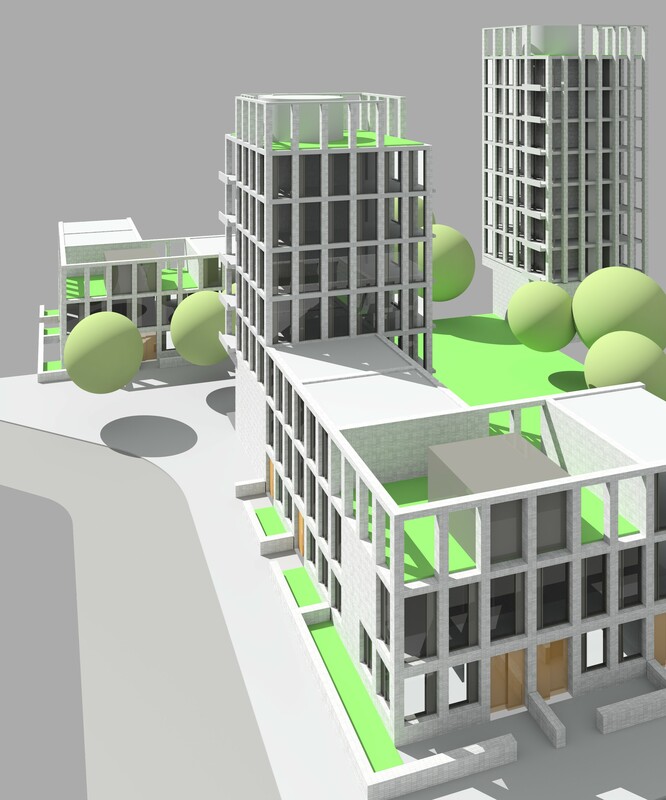 This entry was posted in Density, Interesting projects on July 21, 2015 by charlespwhitaker. Poplar is an interesting district. It has both Robin Hood Gardens (under threat of demolition) and Goldfinger’s Balfron Tower, sister to the Trellick Tower in North Kensington (and currently undergoing a deeply controversial renovation which will displace all of its existing residents, some of them permanently). Poplar also has the Blackwall Tunnel (Northern Approach), the A13 and the A1261. The last of those is euphemistically named ‘Aspen Way’: it is not scenic, nor tree-lined, consisting of six walled-off lanes of traffic, crossable on foot only by bridge or tunnel. The Blackwall Tunnel approach road becomes the six lane A102 and runs past Balfron Tower; this urban motorway was for Lynsey Hanley the most memorable aspect of living in Goldfinger’s building, as she did for a time in the 1990s. 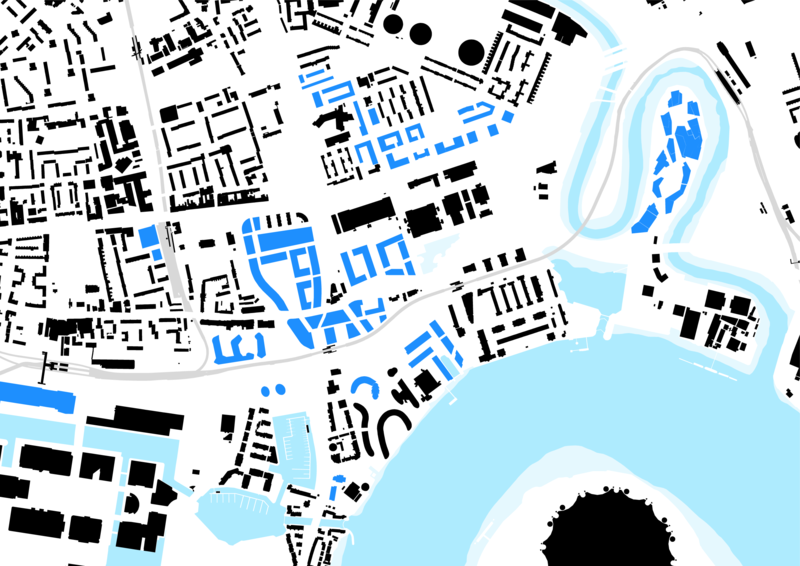 If you plot Poplar’s buildings on a figure-ground drawing you can see they form roughly rectilinear patches, with wide separations between the patches. Within each patch, the ground coverage (and often the density as well) is historically quite low. Take into account the separations and the density drops further. They slice the district into isolated pockets. New development, even if high quality, will not overcome this. The new construction tends towards very high spot density but integration remains poor. 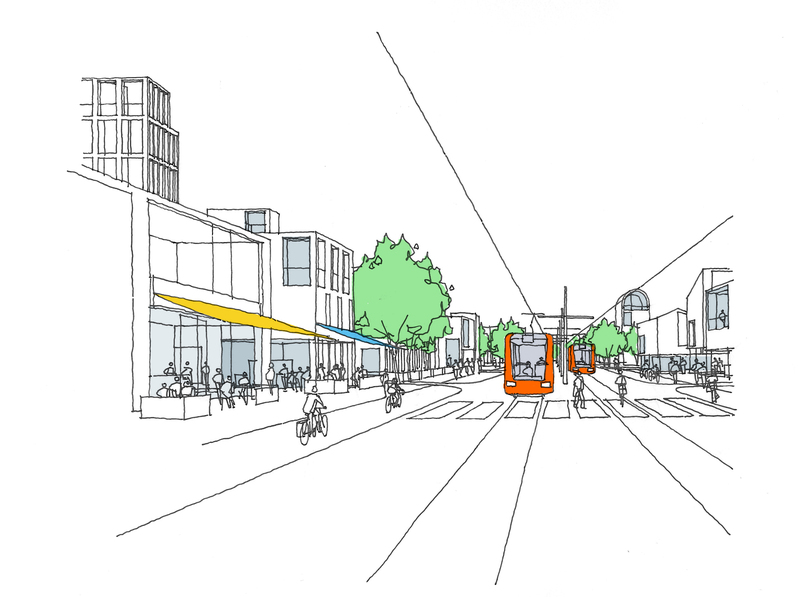 Where new development connects to the DLR – itself an elevated railway – a bubble existence becomes possible. This does have its own interest: the new East London is a city of big objects; heterogenous objects, connected by transit systems which are themselves multi-layered, and laid out in loops, as if the city here were a temporarily wired up, very large scale, Cedric Price style installation. And all viewed from above: the DLR itself gives one of the best views. 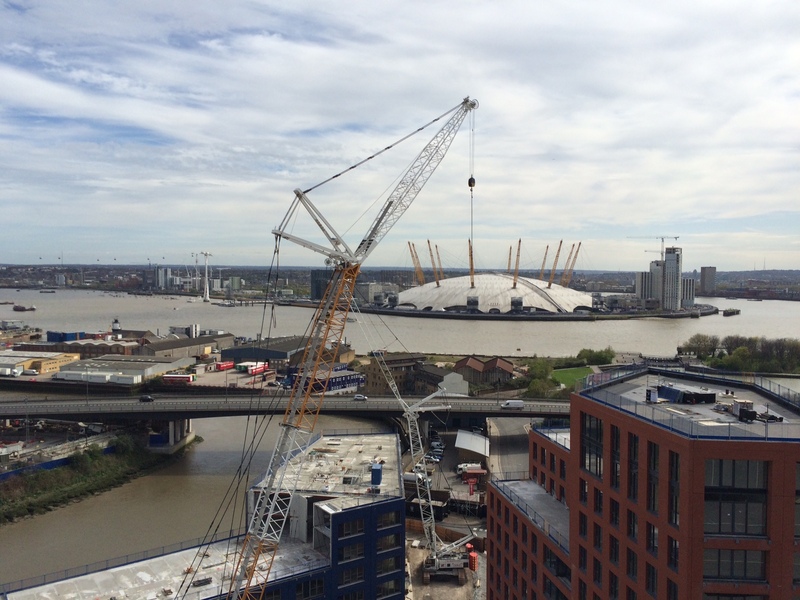 The oddly located ‘Emirates Air Line’ cable car gives an even better view. It is not ‘good urban planning’. Canary Wharf gets a lot of the stick, but things started to go wrong (in the ‘good urban planning’ sense) in the 1960s, when the decision was made to make the Blackwall Tunnel into an arterial. That immediately problematised the Balfron Tower site (highlighted in yellow), Robin Hood Gardens to its south, and the Aberfeldy Estate to the east. I’m not sure what will fix it. Some people talk about brownfield development as the answer to Britain’s housing problem, but they usually forget about what goes alongside former industrial sites: big roads. This entry was posted in Density, Infrastructure on April 22, 2015 by charlespwhitaker. The UK’s coalition government has made some policy changes in favour of self-build. You can see an overview of the changes here. One key change is full exemption from any sort of charge for infrastructure (i.e. the ‘Community Infrastructure Levy’) as discussed in my last post, on the former Olympics site in Stratford. More information about that here. This entry was posted in Baugruppen, Lobbying on April 29, 2014 by charlespwhitaker.